AIB Insights is the Academy of International Business official publication that provides an outlet for short (around 2500 words), interesting, topical, current and thought-provoking articles. Articles can discuss theoretical, empirical, practical, or pedagogical issues affecting the international business community of researchers, practitioners, policy makers, and educators. The publication seeks articles that have an international business and cross-disciplinary orientation with IB researchers and faculty as the intended primary audience. AIB Insights is published four times a year. For additional information, please see the AIB Insights Editorial Policy. 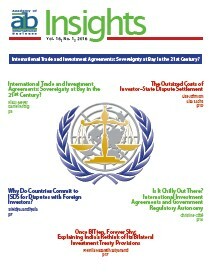 This focused issue, co-edited by Klaus Meyer, Guest Editor, provides a discussion of the controversies surrounding the investor-state dispute settlement (ISDS) system in the context of recent international trade and investment agreements, and its implications for the sovereignty of nation-states in the 21st century. We encourage you to join the discussion by commenting below. International Trade and Investment Agreements: Sovereignty at Bay in the 21st Century? Why Do Countries Commit to ISDS for Disputes with Foreign Investors? You can login using your Facebook, Twitter, Google+ accounts, or you can comment as a guest. To comment as a guest, enter a Name and Email address, and then click on the "I'd rather post as guest" checkbox (only the moderator will see your email address).